Ok after a couple of days of exciting competitions lets get back to some furniture! 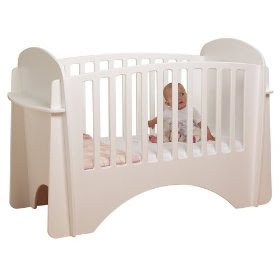 I have already told you all that I have a beautiful Stokke Sleepi - but had i not bought it - this would have been my only other choice when it came to decking out my nursery. I have used the Lindam Solo a few times when I have been product placing on TV, in dramas and in reality shows and it has always been very well received. The big selling point for me is its unique ability to slot together like, well like a lego cot! Show mw a man who wouldn't want to roll his sleeves up and get down and dirty building this little baby and I will buy him a posh new screw driver! The Lindam site states that it can be assembled (or taken down) by one person in less than five minutes. Personally I think that they should take a look at their wording but it would make for interesting viewing at an instore or babyshow challenge! RRP is £199 but there are loads of deals to be had on the web.